I hope this emails finds you all enjoying the many wonderful things about Autumn- the crisp air, the beautiful trees, football, hockey and of course the realization that the holidays will be here before you know it! In this newsletter I continue with the Quilt of the month. This month's selection is a Family Reunion Quilt. The quilt has such a nice story behind it and I love the patriotic theme it has. Exciting news here at MQBM! I am introducing a 5th style quilt for your ordering pleasure! It is called the Staggered Quilt because the blocks are staggered! It comes in all sizes from lap to king size. Check out the pictures below! Other quilts in the works: a gymnastic quilt, many holiday quilts, and a gorgeous baby quilt! Enjoy the pictures and if you are wishing you had or could give a quilt to that someone special in your life, contact me now! These quilts really are one-of-a-kind gifts. Remember quilts take 12-16 weeks! This traditional style lap quilt with premium friendship star sashing was made with over 15 years of family reunion shirts! The patriotic theme, the red and white star sashing, and the navy blue flannel backing all come together to make this quilt extra special. Each year the Earley family reunites wearing their patriotic red white and blue Old Navy t-shirts that are purchased by their mom! The gray Army and the gray Navy shirts seen in the middle of this quilt were added as a representation of the 2 grandchildren serving in the Armed Forces who at times cannot make the reunions. The shirts that make up this quilt were provided by her children and grandchildren. This quilt was given to the mother as a birthday present. I am sure she will cherish for years to come. The center block includes a beautiful picture of the family and the Earley name is embroidered in a beautiful blue right below the photo! Introducing the Staggered Quilt! Named because each block is staggered from the one next to it! The fabric around each block is denim in this quilt! The denim from the boy's jeans-10 pair of them! Each shirt in this quilt is from the many places all over the world that this family has traveled. This quilt design is the 5th style of Memory Quilt that I offer. It was backed with the boy's plaid cotton bed sheets from when he was a child! I just love receiving pictures of happy customers with their quilts! This quilt was really unique because it included 12 gymnastic leotards! Most of the bling was kept on the leotards too! 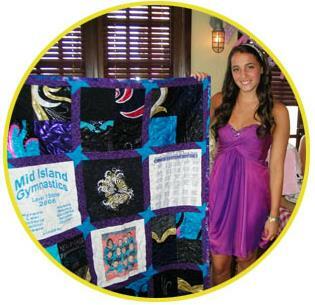 This Memory Quilt was a birthday present for this young lady. I have worked on many really creative quilts this past month, from the exciting new Staggered Quilt to the gymnastic quilt to the family reunion quilt! 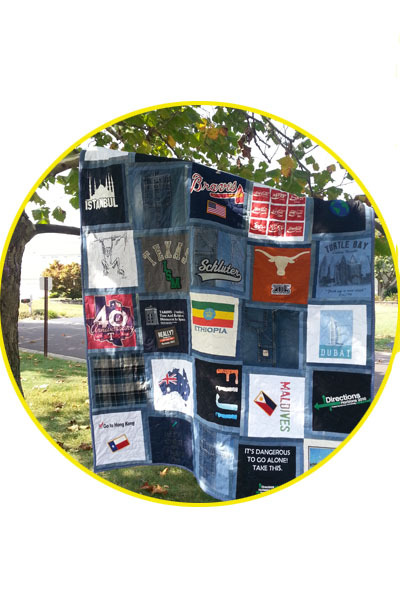 What shirts and other special fabrics do you have waiting to be made into a Memory Quilt? School quilts are still very popular. Recently, I finished a St. Joseph's University Memory quilt for a recent graduate. The many "Hawk Hill" shirts that were included make this quilt one of my favorites. 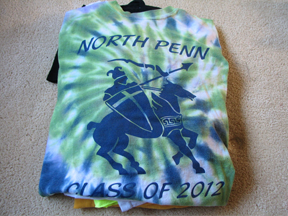 The bright t-shirts help to make this quilt really stand out! Of course St Joe's red and gray were selected as the sashing colors.Click here for more pictures. If you have a pile of shirts that you simply can't part with, why not have them transformed into a work of art that can be treasured for years to come? Not only will you gain a gift, you will de-clutter your house! Recently, a client shared these thoughts about her quilt: "You have outdone yourself! Thank you for making this gift so special! It looks absolutely stunning!! Thanks so much! " I love hearing comments like this. It makes my job that much more rewarding! Memory Quilts make wonderful holiday gifts! They are that one-of-a-kind gift that everyone searches for! So don't delay, order yours today for yourself or that special someone in your life! The holidays will be here before you know it! Copyright © 2013 Memory Quilts by Molly, All rights reserved.